BEEHAVE simulates the development of a honey bee colony and its foraging of nectar and pollen in a realistic landscape. The purpose of BEEHAVE is to allow representing stressors, alone and in combination, of honeybee colonies within a hive and in the landscape: varroa mites transmitting the deformed wing virus (DVW) or the acute paralysis virus (APV), effects of several beekeeping practices, poor forage availability or even forage gaps in the landscape, and pesticide losses of foragers, inhive bees, or brood. BEEHAVE can be freely downloaded from this website. It comes together with a user manual and a detailed model description. BEEHAVE is implemented in the free open-source software (NetLogo). This report summarizes the results of a survey for 57 honey bee hive permit holders in the City of Minneapolis. The survey occurred between January and May 2016 to determine the number of honey bee colonies and extent of threats posed by the parasitic mite, Varroa destructor. Environmental and anti-pesticide activists have made honey bee deaths “the poster child” of their ongoing crusade against ag chemicals, particularly neonicotinoids, says Jeff Harris. “In the long history of man’s relationship with honey bees, going back to Aristotle, who wrote the first manual on beekeeping, there have been many instances of unexplained colony losses — and many occurred long before agricultural pesticides came into widespread use. Varroa mites are the most devastating honeybee parasite and the key to having healthy hives is keeping their numbers low, said an N.C. Department of Agriculture official during a recent program at the Wilkes Agricultural Center in Wilkesboro. “July is a critical time to knock varroa populations down to preserve bee colonies,” added Greg Fariss, one of four NCDA bee inspectors. For more than 10 years now the national government and its agencies have worked to raise awareness about the threat of Varroa mite. At many forums horticulture has been warned of the ramifications about when (not if) Varroa mite establishes in Australia. We now have the first evidence from Biosecurity Queensland that this devastating pest is here. While we are dealing with Varroa jacobsoni rather than Varroa destructor, the experts say it is just a matter of time before jacobsoni will cause as much damage as destructor. In recent years, Colony Collapse Disorder has been blamed on a couple of factors. The first factor, and one that research has proven correct, is neonicotinoids. Neonicotinoids are chemicals found in agricultural pesticides. The second factor is the varroa mite, a microscopic parasite that attaches itself to bees, that feeds off their host and off of the honey bees’ brood. The University of Guam College of Natural and Applied Sciences (CNAS) is uncovering some very interesting information about honeybee health in the Mariana Islands. Chris Rosario, research associate with the Western Pacific Tropical Research Center at CNAS, has been surveying bees on Guam and in the region as part of the Honeybee Health Survey funded by USDA-APHIS. Rosario has been sampling domestic and feral hives to verify the presence or absence of the parasitic mite Varroa destructor, which uses its piercing-sucking mouthparts to feed on the blood of honeybees and their larva. Biosecurity Queensland is boosting its efforts to find and destroy Asian Honey bees in north Queensland after the discovery of more varroa mites. Tests on an Asian honey bee hive found in the backyard of a house in the Townsville suburb of Annandale have confirmed the presence of the potentially destructive pest. Another hive, which also had the mite, was found last month at the Port of Townsville. Like many plants, chestnuts are sensitive to the saliva of potato leafhoppers that is injected while feeding. Damage to leaf tissue can cause reduced photosynthesis, which can impact production, affect nut quality and damage the tree.
. . . Neonicotinoids (e.g., Admire, Nuprid, Porvado and Assail) are longer lasting and narrow spectrum, making them a solid choice for management. 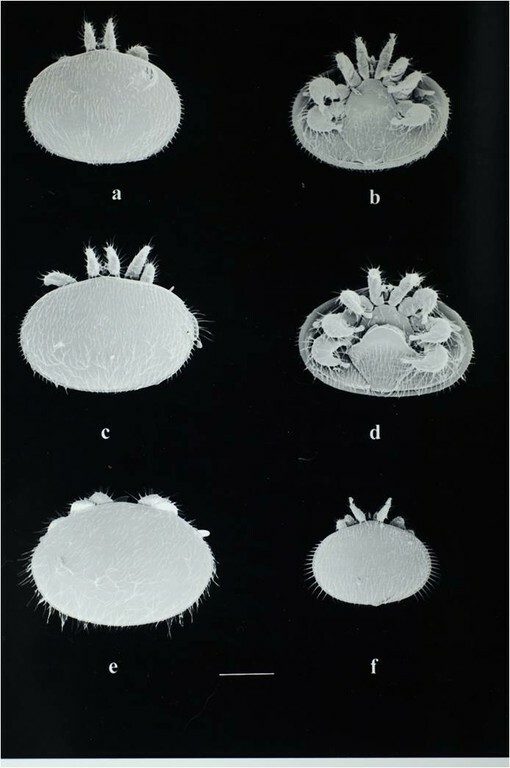 The four species of Varroa: a. V. jacobsoni dorsal view; b. V. jacobsoni ventral view; c. V. destructor dorsal view; d. V. destructor ventral view; e. V. rindereri; f. V. underwoodi. Photo: Denis Anderson. Confirmation from the federal and Queensland governments and industry sources that the two mites in a feral Asian honey bee hive in Townsville, 830 miles north of Brisbane, were jacobsoni means Australia has again dodged the Varroa bullet.